Would someone be kind enough to put their tea down and nip out to the shed and measure across the rim (front and rear if possible) of their trade bike. I'm having a sort of mental block on this and can't quite figure out if I've got the correct tyres on the correct rims ! My meaty 26 x 1 3/4 tyres are on rims that measure just over 1 1/2" (approx 40mm) wide.....that's fine but...I also have 26 x 1 3/8 tyres on similar width rims as well as standard width rims. 1 1/2" (approx 40mm) from rim edge to rim edge ? If this is the case, will any 26" tyre/tire (within reason) fit this size rim. Am I going round in circles here (no pun intended) or have a missed the point somewhere along the line. Pythagoras - sorry I mean Steve. 1 1/2" is exactly the width of the Dunlop rim and the tire is correct. They even made 26 X 2" and 26 X 1 1/2" tires (in Canada) that will fit but they are rare now. What is important is bead size. Not all tires have that stamped on them. Refer to the tire chart I posted and Sheldons website and you should have all the info you need. Your rim has a 571 mm ISO bead size and that is the only mandatory parameter that your tire must absolutely have. Upon re-reading your post, you think that the width is critical. Understand that there's been dozens of tire sizes developed in the last century in many countries and since traditional adult bike design lends itself to wheels in the 26 or 27 inch range, there's been lots of duplication in the sizing of the tires. Fractional sizes are not the same as decimal...again Sheldon lays it out almost completely although there's still some missing sizes. Again, bead size or diameter is everything. Don't try to measure the tire diameter to get the bead size, it's difficult and inaccurate. A typical 700c road rim will often fit widths from 19 mm to 32 mm but thay all have a 622 mm bead. A few millimeters matters. It must be exact. If the bead size is not on the tire, refer to the charts and make your best informed guess. Thanks Warren, thats really got me thinking and should keep me quiet for a while. I'm looking forward to analysing some of these tyre/tire walls here to see exactly what I've got and what they will fit. I must confess that I wasn't 100% sure what the difference was between 26 x 1 x 3/4 and 26 x 2 x 3/4 until recently but I had wondered why some elderly trade bikes seemed to have an enormous gap between tyre/tire surface and mudguard, I think the above 2 x 3/4 set-up probably answers that one when there's a 1 x 3/4 (or even 1 x 3/8 as I've got here) tyre/tire in use. a 26 X 1 1/2 tyre won't fit the rim of a 26 X 1 3/4 wheel though it might fit a 650B rim. Don't forget that some delivery bikes had 26 X 2 X 2 tyres, oh yes indeed. The depth of the tyre itself measured 2 " hence the gap between mudguard and tyre when a 26 X 2 tyre was fitted instead. I think the 26 X 2 X 2 tyres are stacked in the corner with the pile of rocking horse droppings! Matthew - am I glad it isn't the beginning of April! Well, I've had a bit of a rummage and I've unearthed one 26" rim with 1 1/2" width rim, all the rest are standard 26" rims (1 1/4" width rims) so...I'm still on the look out for one more rim that will accomodate the 571 bead size. I've checked more tyre/tire walls than I care to remember, some have lots of information (Michelin) and some have nothing apart from the tyre size and a picture of a one legged lion with half a head ! I have consulted Sheldons stuff, and the more I look, the more I wonder how "on this earth" long did it take to compile all that lot! It's marvellous but very dangerous...I started reading it and completely forgot about the bread in the dodgy toaster hence the fire alarm decided to put on a show for the whole neighbourhood which in turn drew large crowds of onlookers, the result of which meant that I had to run outside with the remnants of two slices of smoldering bread and convince the non-paying audience that I was reading a fascinating article on wheel rim bead sizes and that no harm could possibly be done ! By the way, I've still got that wretched rim (it's actually in quite good condition) that I mentioned a while back...perfect width across the rim for trade bike tyre/tire but it really is looking like a 27"....and that's about as useful to me as that one legged lion with half a head ! As for tyres, the 26 x 1 3/4 tyres will do me fine, the 2" jobbies can stay in the corner with "Neddie, Fury, Black Beauty and all that lot ! Finally, cans of worms were put on this earth to be opened so dare I ask what innertube size is ideal for 26 x 1 3/4....I've had it mentioned to me that a certain size 650 BMX will do the trick ! Agree or disagree ! Steve - so far into the "dark side", I'll need a torch soon. That last message was more entertainment than the BBC can muster on a Saturday evening. I have had family members tittering as I read out your message. Matthew - its so dark I am touch typing. Glad to be of service, incidentally which section do I look under in Sheldons for touch typing ? Steve - I'm cooking the roast this Sunday ! The 650B tire is slightly larger at 584 mm...I would try a good quality (continental?) mountain bike tire first. It will need to stretch but may be just fine. Make sure you use some form of rim tape. Thanks gents, I must have changed hundreds of 26 x 1 3/8 and 28 x 1 1/2 tyres/tubes etc but have never really had to think much outside of these parameters apart from the odd 20" x 1 3/8 now and again. This 1 3/4 stuff has been quite an eye-opener especially where rims are concerned. I do realise that new rims are available but I prefer to acquire dated/original equipment (used or N.O.S.) where possible as I find quite a large percentage of new equipment produced in far away lands is sadly lacking in quality. Anyhow, enough of that drivel, it's now time for a nice cup of tea (in 3 1/4 x 3 1/2 porcelain mug) and three quadrant shaped slices of cake (I refuse to measure the angles or work out the volumetric nonsense) whilst I plan my next problem ! Steve - knowledge really is a wonderful thing. The B.S.A airborne bicycle has a sliding rod with a disc on each end. the rod slides back and forth and there in no place on this rod where the traditional pedal threads into. So awesome as these are, these do not go to the folding bike even though these are folding pedals that are made by B.S.A for B.S.A. bikes. Wow. Interesting and very magical. We lose sight of the fact that these companies were so large and made such a huge amount of things for different markets in different parts of the world. Supplied governments and post offices and such a wide variety from huge factories. I have never seen these before, and I always type in B.S.A. paratrooper bicycle in my e- bay searching. After the war, B.S.A. made other versions of these folding paratrooper bikes, and Colin Stephens has a web site about these bikes and he was surprised to see a Middlemores version of the bike appear so more than one factory made these bikes and their version was likely Danish in origin and he's updating his web site to include this recent discovery. If I knew these were available I would have still switched the original crankset out for a basic B.S.A. named crankset that takes basic traditional thread in type pedals so I would have the B.S.A. crank and the pedals that also say B.S.A. It would be cool! I still think that there was a wooden block type of pedal that clamped over the sliding rod. I know the servicemen had boots with heels but still it is a terrible arrangement. With time and rot and deteoration these wooden pedals got lost and that is why we never see them. This is my theory. The bikes are not shown with anything for a pedal except for that sliding rod that I hated. I owned one and sold it and now own another one and this last one I removed the original army green crankset and I put in a chrome Hercules crankset and I have Raleigh Tourist (Union Germany) pedals in the bike. I found 1/2 by 1/8 th 3 speed chain that is narrow at my then local, bike shop and this runs through a Huret Alvit derailer just fine and I was running a 5 speed derailer cluster and it was fine. Now I have a 3 speed hub in place and I keep the derailer in place for when I get another 5 speed rear wheel. I wish the folding paratrooper ( airborne) bicycle had the Raleigh type headset instead of what it has. My bottom bracket spindle is a Phillips. It's an awesome bike and I highly recommend that folks here buy on off of e- bay and modify it and make it your commuter bike. Surprisingly, the best B.S.A. paratrooper bike design was not British at all but rather Schwinn from Chicago! The book on Schwinn, the large coffee table book shows a prototype Schwinn W.W. 2 bike in army green but the story is that when the war department saw it they knew Schwinn's plant was capable of greater things and they were put to work making other items for the war effort. Take a look at the Schwinn version's pedals. Much better than the B.S.A.! Somewhere along the line, B.S.A. obviously got some sense somewhere, (probably from angry letters from servicemen) who must have hated the sliding rod type bar that was supposed to be the pedals and B.S.A. must have changed the cranks and came up with these awesome folding pedals. I believe the post war B.S.A. versions of the airborne paratrooper bikes used these pedals. Or else there were two different versions of cranks and pedals put into production and for use. Both of my bikes had original war finish B.S.A. craks on them and these pedals as well as Terry's story is right on the money. How did you damage the frame? Regarding the BSA Airborne cycle; The Danish built folding bike it fairly easy to distinguish from the BSA version; the main point to note in photographs is how the ends of the twin frame tubes at the steering head are finished; BSA frames are nicely rounded wereas Danish ones are just straight cut flattened tubes. Danish bikes also have coaster brake only, no BSA on the chainwheel, different head bearing cups and the frame locking butterfly nuts are flat stampings, not nicely rounded like BSAs'.They are fitted originally with Middlemores saddles. The folding pedals that were on e bay were likely to be the earlyest type, far to complicated and expensive for a bike designed to last 50 miles! Next came the sliding pin arrangement, but with a standard looking crank and finally a more substanstial crank with extra width at the pedal end. As far as I know, the original design was not by Schwinn as BSA had this shape frame on a patent pre war. The only post war cycles were the Juvenile versions, boys and girls, which did not fold. I haven't come across any evidence for a clamp on a soldiers boot for the pin pedals but they are not to difficult to use when wearing the leather soled Ammunition boot of the time. Finally, the Danish built version, I first saw at the Beltring Military Vehicle show here in the UK in 2002, where they were being sold for �200. 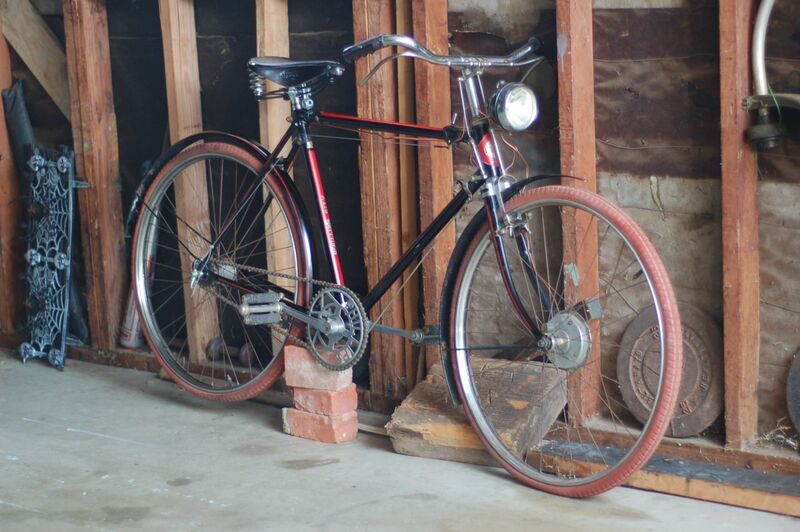 I do not know where to look for serial #'s or the like, but I have been told by some older than me gentlemen that it appears to be an English bike from either the 60's or even from early 50's. The bike has factory looking stickers claiming to be sold by sears and manufactured in Austria (same folks as the Glock?) That would explain it still working! It has a 3-speed thumb shifter that runs a cable ito the rear wheel hub/gear box w/ a small length of chain links extending from the cable including an adjusting device , finally ending in a partially threaded rod also used to adjust for the "gear box". Black and white fenders, with plastic reflector on rear. I have no camera right now. Sorry. If some one will tell me where to look for numbers, or what other info I should include, then it would be appreciated. It looks as though someone kept it in a barn forever. Little rust, and the tires are decent. Heck yeah! I ride it to work, and would like to know more about it. Thank you all. There's not likely to be a database for these. Heck we can't even trace (some) Raleigh serial numbers. It's likely a Puch Steyr bike. Well made equivalents to britsh roadsters and you're doing the right thing by just riding it. It won't be valuable in he near future so enjoy it. The rear hub should have a little oil filler cap. Put a few drops of light non-detergeant straight oil in there every year and it should run maintenance free. That adjuster will allow you to keep your gears lined up. If you search the archives for Austria or Puch or Steyr you'll find some threads. I spent the best part of twenty odd years not knowing where the serial number was on a bike that I didn't know what was....I'm sure there's an easier way to phrase that ! Anyhow, one day I was sitting on the wall outside the doctors waiting for my allotted appointment time when all of a sudden a warm golden ray of sunshine pierced through the clouds above and lit up the rear brake caliper assembly on my every day normal bike of no known origin...until now ! Yes, someone knew I was sitting there staring at the back end of a bike wondering where it was born and what its name was ! The ray of sunshine answered the questions...it was a Puch with serial number in that funny continental style...that sort of squared off corners effect (its probably got some clever Latin name but I can't research this further as the final 16 pages of my Collins Concise Dictionary Plus have escaped leaving me with the "Causes of Death in Britain 1945-1987" graph as the final page) ! The Weinmann (I'm not even sure if that's spelt correctly) brake caliper assembly attaches to a support bracket and on that bracket probably under a good coat of paint facing outwards towards the rear of the bike are the relevant details. The moral of the story is first of all to drop a heavy weight on your toe then let it simmer gently for two to three days in order to get it infected (when you really thought it would just go away) then aim to make an appointment at the doctors at a time that will coincide with a natural burst of sunlight in the general direction of the back end of your bike when your staring at it out of boredom. Hopefully, if you've been a good boy...this should do the trick. Steve - photo of bike attached (probably 1974 model). Fell off the chair, hit my head! This is one of the nicest and cleanest beautiful cycles I have ever seen on this site or in person, anywhere I have been. Those red tires are ultra rare the chrome is perfect and those rims are perfection. I never see these on e- bay. Thats how rare this is. saw stars, and passed out! Hang it up and look at it. Too nice to be ridden, unless indoors. A rare prize seldom seen. This is from among the best years of production Phillips had. You are firmly seated in the Glorious "Golden Era" when Phillips ruled supreme. Agreed...John Bull red tyres perhaps? Really sweet. Pursuant to the posts of others, I was somewhat prepared when I clicked over to the images. Anyone else that's not yet looked but is about to, these images absolutely call for "DROOLING TOWEL REQUIRED". VERY nice machine! Simply amazing! Larry "Boneman" Bone - seeing RED... in a good way. OOOO, Weeee!! Talk about BARN FRESH!! What you have is an example par excellence of what may of us hope to obtain. Savour, admire, ride, use and above all enjoy. The sublime delight you will experience when riding this machine will out match your expectations. The ease of pedalling, the loss of all sense of time and the gentle exercise will be exquisite. Look after this machine for future generations to enjoy. Do not confine it to a showroom, allow it to take to the road from time to time. The rear hub is probably an SA AW from 1937 which may be slightly younger than the bicycle itself. When I first looked at it I thought it might have been a trick, how can something 71 years old be so good ? I'm glad the other more experienced chaps have commented because I wasn't sure what to say ! Has it been kept in a climate controlled room or just a barn in a lovely kind weather area ? Steve - a ray of sunshine. Thanks folks! Your reactions are quite inspiring. I'll have to keep it in a safe, dry place, and perhaps every once in a while, put another wheelset on there and give it a spin - perhaps for vintage/classic rides. My current problem is that the '73 Phillips I've been riding was damaged when hit by a Prius (my brother, the rider, was OK), and I'm looking for another 23" bike to replace it. I had thoughts of putting new wheels on this bike, but I think I'll just take care of it for the future. I still have never been able to find any info on it - even as the interwebs continue to expand and develop more tubes. I nominate this bike and this fellow for the Gold Medal for first prize and "best of show"
Oh, that headlight!! I owned the dynohub set, new in the box. I had one of those headlights!